After I read about the benefits of Cranberry Juice on The Boudoir Blog , it became an essential element of my daily diet . I drink it twice a day , since I did last summer I kissed flu goodbye even when winter arrived. 1. Highly effective in the treatment of urinary tract, bladder, and kidney infections. 2. Protection against heart disease. 3. Cranberry antioxidents help protect you against cancer (especially ovarian cancer)! 5- Cures colds and flues ( Vitamin C). 6- Strengthens bones and teeth (good source of Calcium). For More information read the whole post on her blog. 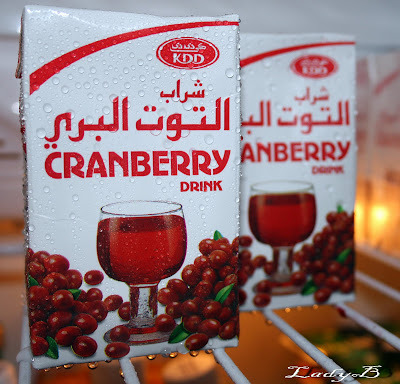 But I think it must be fresh not the KDD , I think they add artificial colors to that one,, don't you think so?